West Bromwich Albion goalkeeper Boaz Myhill has pulled out of Wales' squad for their friendly against Finland in Cardiff on 16 November. Myhill needs treatment on an Achilles tendon problem and ligament damage in his left thumb. 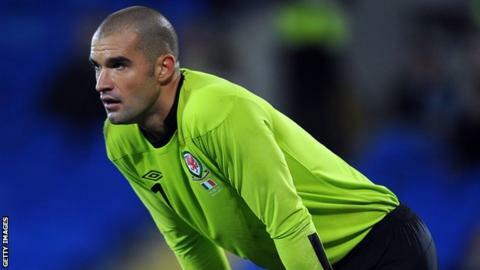 "I am going to need treatment on a couple of injuries I've picked up in recent weeks," Myhill said. Midfielders David Vaughan (hamstring) and Andrew Crofts (groin) have also withdrawn injured. Manager Chris Coleman otherwise has a full squad including both Real Madrid's Gareth Bale and Arsenal's Aaron Ramsey, while West Ham's Jack Collison is added as midfield cover. It is a blow for Myhill who had hinted his international future had been uncertain after he was dropped for Wolves' Wayne Hennessey for Wales' back-to-back World Cup qualifiers against Macedonia and Belgium in October. Wales' preparations for those qualifiers against Macedonia and Belgium last month were hampered when 12 players pulled out with injuries. But captain Ashley Williams, Ben Davies, Joe Allen and Joe Ledley return for the visit of Finland, alongside Bale. West Ham's James Collins, who has resolved his differences with Coleman, is also included. Liverpool's Harry Wilson, 16, who became the country's youngest player when he came on as a late substitute in the 1-1 draw in Belgium, is on the standby list. Coleman's contract with Wales ends following the friendly against Finland at the Cardiff City Stadium and he has been linked with the managerial vacancy at former club Crystal Palace. John Hartson, a member of Coleman's coaching team, stepped down from his role last week. The former Arsenal and Celtic striker cited increased media commitments and family reasons for his decision to quit as assistant manager. Wales squad: Wayne Hennessey (Wolverhampton Wanderers - loan Yeovil Town), Owain Fon Williams (Tranmere Rovers), James Collins (West Ham United), Ben Davies (Swansea City), Chris Gunter (Reading), Ashley Richards (Swansea City - loan Huddersfield Town), Sam Ricketts (Wolverhampton Wanderers), Neil Taylor (Swansea City), Rhoys Wiggins (Charlton Athletic), Ashley Williams (Swansea City), Joe Allen (Liverpool), David Cotterill (Doncaster Rovers), Jack Collison (West Ham United), Andy King (Leicester City), Joe Ledley (Celtic), Aaron Ramsey (Arsenal), Gareth Bale (Real Madrid), Simon Church (Charlton Athletic), Jermaine Easter (Millwall), Hal Robson-Kanu (Reading), Sam Vokes (Burnley). Standby Steve Morison (Millwall), Joel Lynch (Huddersfield Town), Harry Wilson (Liverpool), Shaun MacDonald (AFC Bournemouth), James Wilson (Bristol City - loan Cheltenham Town), Lloyd Isgrove (Southampton), Owain Tudur Jones (Hibernian).